The National Guide is presented as a tool for healthcare professionals, patients and other consumers to recommend or use the probiotic products listed as scientifically proven to prevent diarrhea caused by the use of antibiotics. While antibiotics fight bacterial pathogens, they also have a disruptive effect on the body’s own gut bacteria. One in four adults experiences diarrhea caused by ADD. The National Guide promotes probiotics for their function of protecting the gut flora from the disruptive effects of antibiotic treatment, fostering recovery and reducing the risk of recurring infections. The research behind the Guide involves a literature study of clinical studies that are all based on randomized, double-blind and placebo-controlled trials. Moreover, all of the trials clearly define AAD and have a probiotic administration regime for a period no shorter than the antibiotic therapy. 32 of the 128 initially identified clinical studies were selected in line with the aforementioned criteria. After the selection and review process, available probiotic products on the Dutch market were listed to be subsequently matched with the formulations as proven effective in the selected clinical studies. 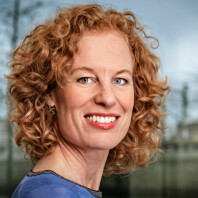 Only eight probiotic dairy products and food supplements marketed in the Netherlands specified on their label the respective probiotic strain(s) and number of colony-forming units (CFUs) and could therefore be used in the research. The listed probiotic products were awarded with one (lowest) to three (highest) stars for their proven effect as demonstrated in at least one to three clinical studies. The strain Lactobacillus rhamnosus GG with a minimal daily dose of 2 × 109 CFU was found in at least three clinical studies and therefore awarded with a three-star recommendation. This strain was found in 2 products, both of which are food supplements. Several multi-strain formulations resulted in a one-star recommendation; 5 food supplements and 1 dairy product matched such a formulation. 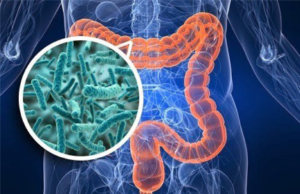 The multi-strain formulation Lactobacillus rhamnosus GG, Lactobacillus acidophilus LA-5 and Bifidobacterium lactis BB-12 was present in two clinical studies and therefore assigned with a two-star recommendation. However, none of the listed probiotic products found on the Dutch market contained this formulation. The research is not exhaustive as probiotic products other than the eight that were included in the study might also be effective. However, since this was not communicated on the label, they could not be included in the research. To overcome this gap, TNO and Micropia as the initiators of the National Guide call for the labeling of the probiotic strains and number of CFUs on all probiotic products EU-wide. This could also expand the potential of the Guide. At this moment, strain and CFU labeling of probiotic products is not legally mandatory under the Food Information for Consumer Regulation. The initiators also developed a special probiotic label to address this claimed deficiency. The label is based on the probiotic label used in the US as created by the International Scientific Association for Probiotics and Prebiotics (ISAPP). 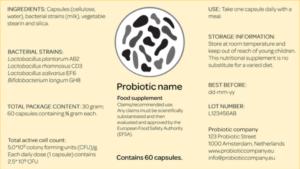 The labels are in line with the information that should be demonstrated on probiotic labels according to the FAO/WHO 2002 Working Group on Guidelines for the Evaluation of Probiotics in Food. National Guide to circumvent limitations under the Claims Regulation? The Claims Regulation applies to health (and nutrition) claims made in commercial communications of foods to end consumers. This may be in the labeling, presentation or advertising of the food. Besides information on or about the product itself, also general advertising and promotional campaigns such as those supported in whole or in part by public authorities fall within the scope of the Regulation. Moreover, since the Innova Vital case, we know that (science-based) communications made to healthcare professionals may also be regulated by the Claims regulation. The rationale thereof is that the healthcare professional can promote or recommend the food product at issue by passing the information on to the patient as end consumer. Only non-commercial communications, such as publications that are shared in a purely scientific context, are excluded from the Regulation. It must be noted that the National Guide is, unlike health claims, not a commercial communication originating from food business operators. This does, however, not necessarily mean that food business operators are free to use the science-based Guide in their communication with (potential) consumers or even with healthcare professionals without any reservation. The Guide, which not only lists the probiotic formulations that are beneficial for the human gut flora, but even the names of products that contain those formulations, could turn commercial when referred to by a food business. Moreover, when shared in such a context, the claims made in the National Guide may even enter the medical domain due to the preventive function assigned to foods containing probiotics. The history of probiotic health claim applications has shown that EFSA is not easily convinced of the evidence that is correspondingly provided. The National Guide is, however, not subject to approval from the European Commission, backed by a positive opinion from EFSA. The Guide’s publication in the peer-reviewed journal BMC Gastroenterology nevertheless contributes to the verification of its scientific substantiation. The Guide therefore appears as an innovative, science-based alternative for probiotic health claims. At the same time, food business operators should be careful in referring to the National Guide to not act beyond the borders of the Claims Regulation and to stay away from medical claims. As a very minimum however, it seems to be valuable work to be adopted by branch organizations or research exchange platforms, such as the International Probiotics Association.